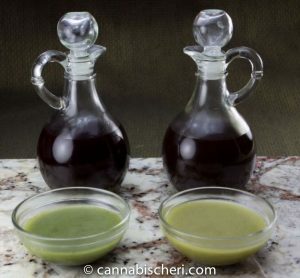 Marijuana oil — AKA canna-oil, or weed oil to use a more slacker term, is a staple of many cannabis recipes. Since THC, the psychoactive component in marijuana, is fat soluble, edible oils make ideal ways to bond it to food. Likewise marijuana oils are the backbone of many medicated foods. With these staples stored in your refrigerator or freezer you’re always ready to cook with cannabis. What Kind of Oil and Marijuana is Best? I am always asked what kind of oil is best to infuse. That depends what you are going to use it for. A neutral oil like canola, grapeseed, or vegetable oil is most versatile as you can use it most any recipe calling for oil. For additional flavor elements, olive oil is a great choice. You can even infuse solid at room temperature fats like coconut oil or vegetable shortening. Use whatever works best for what you are planning to cook with it. As to the cannabis plant material itself, you can cook with any kind of marijuana from trimmings to flowers. You will need to adjust the amount used depending on the potency of the plant and what parts of it you are using. Check out the Understanding Cannabis Dosages page for additional information and dose ranges. 1 1/4 cups oil, olive, vegetable, canola, grapeseed, coconut, etc. Why Add Water When Making Marijuana Oil? You might be wondering why I include water as an ingredient. Including water, especially when infusing marijuana oil on the stovetop, insures the cannabis will never reach a higher temperature than the boiling point or 212 degrees F. More importantly, the chlorophyll and terpenes – the parts of the plant that give it its flavor and color — are water soluble and most will likewise bind to water during the cooking process instead of infusing themselves into the fats along with the THC. This will mean less herbal flavor and green color in the finished marijuana oil. Nonetheless, even when using water in the mix the marijuana oil might still appear quite green. The shade of green will vary from strain to strain with some coming out pale green or almost yellow, while other marijuana oils will take on a deep forest green color. Keep in mind, however, that color has nothing to do with potency. 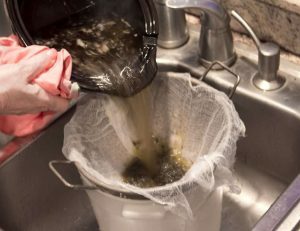 Another reason to use this technique is without water in the mix, the plant material tends absorbs too much of the oil. This means usable product is going into the trash, a problem that’s reduced when adding water. The increased liquid volume also gives cooks the option to add more plant material in order to make more concentrated infusions if they wish. Cannabis Oil – Slow Cooker Method (best choice): Add oil, marijuana plant material, and water to the slow cooker and cook on low for 4 to 8 hours. I know some cooks who cook their oil for as much as 2 or 3 days in the slow cooker. Feel free to do so if you choose. It seems like overkill to me and after having tested longer cooking times, I found no improvement in quality or potency. In fact, I noticed a stronger herbal flavor and not much else. You can actually cook for less time, just make sure your mixture has time to come to a full simmer. Cannabis Oil – Stovetop Method: Place oil, cannabis plant material, and water in a large lidded Dutch oven on the stove top. Bring to a boil, reduce heat to very low and simmer for 2 to 4 hours. Take care and monitor the liquid level often, adding water as necessary to always keep at least 3 cups in the pot. Simmering marijuana on the stovetop is very aromatic. If you’re worried about nosy neighbors wondering what you are up to, cook other strong smelling foods such as roasting garlic at the same time in order to help camouflage the smell. Better still, use a slow cooker. The method of draining is identical for stovetop and slow cooker methods. Place a cheesecloth lined strainer over a large pot or bowl and strain the liquid through this. 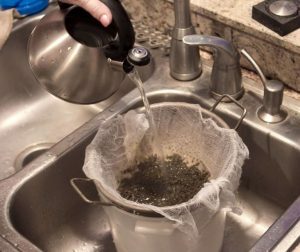 Before discarding plant material, pour a large kettle full of boiling water over the full strainer in order to wash through any extra oil clinging to the plant material. Allow to cool then squeeze out as much liquid as possible. Discard the plant material. If you are using a solid at room temperature fat like coconut oil or shortening, chill water and oil. The infused oil will harden into a solid when chilled making it easy for you to simply lift the piece off of the water below and discard the water. Give the marijuana oil an extra rinse with boiling water to extract as much as possible. In most instances, oil will rise to the top of the water but won’t solidify. No problem. You can use a spoon to skim the oil off the water. Even better is a kitchen gadget called a gravy separator that looks like a small pitcher with the spout originating on the bottom. This unique design allows the water to be poured out while retaining every drop of the oil floating at the top. During the Thanksgiving and Christmas holidays, gravy separators are sold everywhere, otherwise find them at gourmet shops. You can also find extra large gravy separators year round at restaurant supply stores. Now it’s time to strain one more time to remove as much sediment as possible. Place a double layer of cheesecloth over a strainer and pour the oil mixture through. Refrigerate infused oil until ready to use or freeze for even longer storage. Fats can still go rancid in the freezer so try to use within 3 months. You’re now ready to start cooking with marijuana oil! 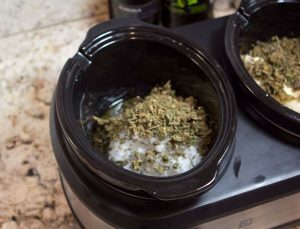 Hamilton Beach makes a line of slow cookers (pictured in this article) that are great for reducing cooking odors when making marijuana oil. I am sure the fine folks at Hamilton Beach did not design the Stay and Go Slow Cooker for this specific purpose, but nonetheless they work great. That’s because it has a rubber gasket on the lid and a clamp you can use to keep the slow cooker tightly closed. People going to pot luck suppers (no, not the kinds with cannabis) love this feature as you can transport food in the slow cooker without it sloshing over. But for cannabis cooks its beauty is in the fact that you will hardly smell the odor of simmering marijuana when infusing butter or oil. At least not until you open the lid. I discovered this quite by accident, but it works. The Stay and Go Slow Cooker is also a quality product to use when making non-cannabis infused meals. The other option is to use an Instant Pot or other multicooker set to the slow cooker setting. Almost no odor! If you like to make small batches of marijuana oil, consider investing in the Ardent Lift Decarboxylator. Not only does it take all the guesswork out of decarboxylation, you can actually make small batched of infusions right in the Lift. Learn more and watch the video demonstration at this link. Wondering how long the oil will store in the refrigerator without becoming rancid? Hi Ronda, Storing an infused oil is really no different than storing the original oil. If it’s stored in a green or brown bottle with an airtight lid, it should last up to two years in the refrigerator. Can i put this in oil cartridges for oil pens? No, this is for cooking and edibles. That is a different type of oil. It gets confusing, here is an article that might help clarify. No! Not fir vaping. You never vape anything with cooking oil. If you want to vape straight rising…buy a vaporizer like a YOCAN EVOLVE PLUS. IF u want to make ejuice…without nicotine…you need to buy vg…..vegetable glycerine and small bottle if pg. Google it. Any vape supply sells it. U can get a liter of vg or pg for about 10.00. only safe way to vape. Vg and of vaporizes at high temps. If u Vaped oil…..cooking oil….you are basically putting hot oil in your lungs and it will stuck to hair follicals in lungs…would basically clog up your lungs and your lungs could not function or filter normally. Cannabinoids are antimicrobial, so it’ll actually last longer than the oil would without them. Are you decarbing your plant material at all before infusing in the oil? ty! Hi, It depends on what I’m using the oil for. But, the short answer is yes. However, if the oil will be used as a topical or for someone who doesn’t want as much “high” as others, then the answer is no. I hope this helps. Yes, decarbing first will give you more potency. How would you recommend carboxylating/activating the cannabinoid that can’t be metabolized without such processes? I read somewhere that the temperature required for that is around 240 F, but I’m unsure about whether or not this would be critical for cooking. I normally make brownies and I suspect that baked goods probably don’t get anywhere near that temperature in the center. I like the idea of having water in with the oil, but I don’t want to limit the efficacy of my oil. Do you think that I could heat the oil to 240 F after I strain It? Nevermind, I remembered reading here or another page to carb. in the oven beforehand. Yes it is best to DECARBOXYLATE first for maximum potency. Hi I’m new this and have a question. Is the thc as well as cbd high in the oil when you are done following all the steps? I’m trying to make it with a good dose of both and I don’t want to use the alcohol method. I am not sure which alcohol method you are referring to, do you mean making a tincture? Dumb question I guess but would you be able to smoke it? Was wondering if i put a drop or two on my bowl if it would have any effect or just wasting my time. I think it’s probably best to just use it in edibles. I don’t know of anyone who smokes infused vegetable or olive oil. Can you make marijuana oil with kief only? Absolutely! Yes. Or you can forego making th butter entirely an simply stir decarboxylated kief into your recipes. FOr more info see Cooking with Kief and Hash. I always decarb in the oven 1st at 250 degrees for 25-27 minutes. I use flower broken up into a layer spread out on a plate or cookie sheet usually covered with tinfoil or an oven/Turkey bag if making a lot. I then do the stovetop method trying to keep it between 190-200deg for 2 hrs. I’ve tried for up to 5hrs and didn’t notice much difference. Can I use the oil drained herb leftover in pesto? I would hate to waste the herb. You technically can, but I wouldn’t. You aren’t really wasting it by tossing out the plant material after making butter because you have already extracted the good parts. Yes there might be a few trichomes left, but not much, so to my mind all this will really do is give you yucky tasting pesto. (I do make infused pesto, but I use cannabis infused oil). So feel free to give it a try if you like, but my recommendation is to toss the leftover plant material after extractions. WHatever you do, don’t put it down the garbage disposal (I learned that the hard way, seized up and had to call a plumber). Hi, can i add a tablespoon of liquid lecithin to the crockpot before heating my bud and coconut oil? I usually add it to my cannabutter after i infuse and cool, and melt again. Tried adding before one time and came out like mud. Maybe just melt the coconut oil again after and add then? I am not sure as I do not use lecithin and see no reason to use it when infusing oil as lecithin helps bind water and oil and when infusing coconut oil you are binding fat to fat. I am doing more research into lecithin now and there will be a feature on it soon. There are certain cooking application where I could see it being useful, but for infusing oil and butter, I do not see that it is necessary, unless I uncover something in further research that I haven’t already. doesn’t lecithin make your body absorb the thc better and faster? I read that somewhere and don’t know what is true. Also for this recipe do you strain coconut oil 2 times, or is one time enough after you have pored boiling water over it, and let it cool down? Some people say that, but I have yet to find scientific proof of that. I do the boiling water, strain, then strain again for fine particulates, but that is optional. If using the crockpot method do you still decarb first or does it decarb when it’s cooking in the crockpot? Lab tests show you can extract more potency by decarbing first, even with long slow cooking extractions. You can, but it is not required. If you do maybe once every hour or two but it’s really nothing you need to worry about. Hi there! If I wanted to use trim instead of the buds, would you recommend an amount needed to copy this recipe? Any amount you have will do, it just will be slightly less potent using trim than buds. You can use my dosage calculator at my FREE dosing course to figure out how strong your infusion will be with less potent leaves vs buds. I’m wondering if I should measure my coconut oil in solid or liquid form for the recipe? Thanks! For the best accuracy, liquid is best. Dumb question but if I am using a non solid at room temperature oil such as olive oil how do I extract the water from the canna oil? Not a dumb question other than the article covers this if you go back and read the section on draining and straining. Hi Cheri, I am very new and had been given 1:1g in mct oil of thc / cbd 50/50 to try (each 200mg) to try to make foods with. I assume, being a liquid, I do not need to decarb but am ready to make into chocolate and brownies (for instance). Can I use this straight into your recipes and if so how do I calculate the conversion if I dont want to use or make butter and only have this little bit on hand. We really have no way of knowing if it was decarbed and if so how well it was so it may or may not be. You could decarb but may end up over decarbing. In all liklihood it has already been decarbed, esp if you have a lab test that list amount of THC (as opposed to THC-A). I am not clear on how much you have. Are you saying you have 1 gram of oil that contains 400 mgs cannabinoids (CBD and THC)? But yes you can add this directly to recipes, there is nothing magical about butter as opposed to other types of fats. Is there a use for the water after removing the oil? Not really. It will taste pretty yucky. I guess you could water plants with it but that’s about it. My dog with arthritis loves drinking the water and will eat the leftover material straight . Be careful please when it comes to cannabis and pets, especially dogs! All species above mollusks have an endocannabinoid system and are born with endocannabinoids in their systems. This means nature hardwired them to respond to cannabis, and in fact, cannabis can have many therapeutic benefits for pets, including, as you have referenced, relief from arthritis pain. BUT…that said, you must be EXTREMELY cautious when it comes to THC and pets, especially dogs as dogs have more cannabinoid receptors in their brains than any other species! Likewise, it is very easy for them to get too much. In most cases they will sleep it off and be fine but it is scary for the owner to watch and uncomfortable for the pet if they get too much. Overdose is characterized by a condition known as Static Ataxia, which is characterized by a wide-legged stance, drooling, disorientation, and the animal being hypersensitive to touch (if you pet dog who has had too much, it will react almost like an electrical shock). They are likely to have quick shallow breathing too. It can take hours to wear off and it is scary to watch. CBD-only medicine or high CBD strains are far safer for dogs. I am not a doctor or a vet, but Colorado holistic veternarian Dr. Rober Silver has done a lot of work and research in this area and has written a book on the subject. Find his website at http://www.potforpets.info/. Am harvesting my Sour Tsunami today and planning on making cream or lotion. My question is, can I dry and decarb in one step or should I use my normal drying procedure before decarbing? You can skip the cure if you are going to just infuse the plant material. You can decarb, I might add a half hour or so at a low temp (under 200) to dry it a bit, then decarb, but if you don’t have this option it should still work. Decarbing is about a temperature difference, not the level of dryness, so it should work fine. I am getting ready to make topical oil to be used in lotion and salves. Do I use the same process as making edible oil only using almond or jojoba (or whatever topical oil I want)? Yep, you got it! The only difference for me when making topicals is I decarb some of it and leave some undecarbed so I get full spectrum (both THC-A and CBD-A along with THC and CBD). This is optional, but I find it makes the most effective topicals. 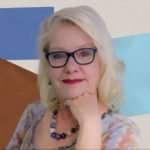 I am currently at work on a new online course about making cannabis topicals, but you are definitely on the right track. I followed your directions with the crockpot method and placed the oil/water solution in the refrigerator. It has been in there overnight and is still not separating. Ideas or thoughts? Wow, I am not sure what to say to this Oil and water separate, that is just science, so I am not sure how this could possibly be. I am assuming you strained out the plant material? I am not understanding, the fridge is not even necessary just makes it easier, even on the counter it should separate. I am at a loss. I know!! This is the first time I have ever added water to this process. I thought about adding more olive oil to the mix. I just put it in the freezer to see what they would do. I am so bummed. I dont know if I should throw it out and start over. Just typing that last sentence hurt my heart ha!! Don’t throw it out yet! I would finely filter it, but it in the fridge or freezer and see what happens. It just makes no sense. Oil and water separate. You didn’t add lecithin did you? That might make oil and water bind. But that was not in my instructions. Wow, I have no answer. It’s just physics. Oil and water separate. Feel free to slap me, but…are you sure you remembered to add the oil? 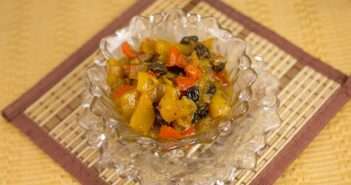 Have used your recipe many times and it always separates. Sometimes if the water and oil are dark it is a little hard to see the separation, but if you hold your container up to the light it becomes obvious. Thank you Paige. Maybe that is the issue cause otherwise I can’t understand how it would be possible for them not to separate. Yes, the boiling water is to help “rinse” off butter or oil clinging to the plant material. I have experimented with more than one wash and found it was not worth it, but one rinse from say a teakettle full of boiling water helps get more finished product. Then let the whole thing cool and separate. When doing your oil in a crock pot, do you leave the lid on or of. Definitely on, although I take it off to stir every now and again, and also if you find it simmering too hard you can remove and stir to lower the temperature or leave it on a little off kilter, Otherwise, on. So you’ve make it so simple. I think I’ll strain what’s cooking now then I’ll try putting it back in the slow cooker with oil and boiling water (help the decarb) then I get a bit of practice with the water separation part. I want to make happy gummy bears and I won’t have to put so much sugar in the hide the green taste. There is absolutely no single way to answer that question. Not even close. What kind of edibles? Plus at what dosage? Everyone is drastically different. Check out the articles on dosing on this website and also my free edibles dosing class at http://www.Cannademy.com. The beauty of making your own is you get to make the exact edibles you like at the dosage YOU individually need. I know it is not the quick easy answer you want to hear, but I tell the truth. And the truth is, it depends on what you are making and at what strength you want the finished edibles to be. If you forget to decarboxylate in the oven first, can you heat the oil up to a higher temperature after you separate it from the water to finish the process? I don’t see why that would not work. Hello….. I made canna oil with coconut oil but did not use water in the mix. Did I ruin it? No, not at all. Adding water is strictly optional. Some people like to do it (in most instances I do), some people do not like it. Entirely up to you. So i did the slow cooker method. The problem is does scooping the oil away from the water with a spoon an effective method? It’s a little too late to buy that gravy separator right now? However you can strain is fine, the gravy separator is optional. Other methods include a strainer lined with cheesecloth, a mesh nut bag (like used for making vegan nut milks) or a French Press coffee maker. Even a strainer with a coffee filter in a pinch (it might take a while). Can I use the oil in the same ratio as on the boxed brownie mix or should it be diluted down? You will still need the overall amount of oil on the brownie box, but it does not all have to be cannabis oil. How much cannabis oil will depend on your individual dosage needs and the strength of the cannabis you are cooking with. Please take my free dosing class for more details. So I’m making about 4 ounces of flower but only put 8 cups of water did I ruin it? And after it slowcooks I just stain it right? Not at all, the amount of water is not important. Strain in the separate the fat from the water and you should be good to go! Are you sure I only need 1/2 oz for one cup of oil? That’s seems awfully small. Your pictures looks like more than 1/2 oz. Nope I am not sure at all. I have no idea what you need. As I say, over and over again on this website, in my books, and in my classes, EVERYONE’s needs are different. But the beaty of making your own is you can adjust to get what you need. The recipes on this site are calculated on using a 1/2 ounce to 1 cup butter, which in most cases will be pretty strong (depending on the strength of the cannabis of course). When cooking for myself, I will often double that. Also making stronger infusions let’s you use less of them to get the same dose, which can improve flavor. So amounts are a suggestion and cannabis cooks should always take the amounts given in ANY recipe with a grain of salt and adjust upwards or downwards according to their own needs. My free dosing class can help you do that. It will decarb somewhat during cooking in the slow cooker but for best results decarb in the oven or the Ardent Nova first then make your butter in the crockpot. On its own the slow cooker does not do as good a job and does not get hot enough to decarb it all. Do I need to refrigerate it if I just add oil & no water ? No, the purpose of the water is for the oil to harden to make it easier to separate, so it is not necessary to refrigerate. That said, refrigerating or even freezing the finished oil will give you a much longer shelf life. For more information, see this article. I didn’t strain my olive oil after cooking the stove top method now it smells funny. It been about a week. Should I throw it out or can I still strain it and use it? Funny is relative. Funny rotten, throw it out. Funny like weed strain and use. Did you use water, if so this would increase chances of something growing that you don’t want in there. If it is just oil and cannabis and the cannabis in submerged, you might be OK. If you stored it in the fridge, you should be fine either way. I could not tell for sure unless I saw and smelled it. But when in doubt, my motto is always to toss it out. Sorry. Partially frozen and oil did not separate from the water? Separate in the fridge not freezer. Store oil long term in the freezer. I suspect it froze before it separated? Physics say oil and water separate. Hey i just tried the oil in the crockpot method, turned out to what seems like good oil ( have done stove top in past) i tried two teaspoons in a small amount of water for a potency test but havent had any real results ( used about 2 1/2 cups of trimmings and small buds to 1 cup oil) im just curious is that possible to the way ive ingested it? Would baking into something and trying that be a better “strength” test? Thanks! It might be better but you should feel just the oil as well. Did you decarb first? It seems like you have plenty of plant material SOmetimes it can take a while and I have noticed that different strains come on faster (or slower) than others. 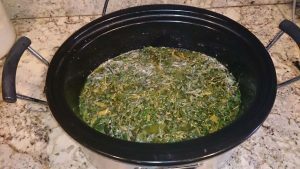 I always fully decarboxylate before cooking in the slow cooker as the slow cooker does not get hot enough (https://www.cannabischeri.com/featured/marijuana-decarboxylation/ ). Lower and slower will preserve more cannabinoids and terpenes in theory, so I usually opt for that, but it depends, if I am in a hurry, I will infuse on a higher setting. Both have gotten great results in the finished edibles, but I do not have lab tests to compare, unfortunately. Hi Cheri, I made what I thought was a double-infused oil with 4 oz of decarbed trim and 3c of coconut oil. I made it in two batches because the volume of trim was much higher than the oil. For the second batch of new trim I used the same infused 3c of oil. I thought I would have rocket launchers for my final product but I don’t. 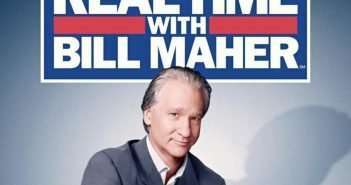 Is it true that oil has a saturation point? Perhaps I over infused and ended up sadly wasting a lot of my product? And, if I simply reheated the infused oil for another hour without the trim would it extract more? Thanks in advance for your response. Yes you can oversaturate but I am not sure of the exact amounts (this gets into some mighty geeky science and calculations). I usually don’t use any more than an ounce per cup, and that is probably pushing it. As to reheating I am not sure. Did you debarb your cannabis first? If so I am not sure reheating would do anything. If you didn’t decarb first, then yes, give it a try and see if it helps as you could potentially get more potency by activating more of the cannabis (slow cookers don’t usually get hot enough to fully decarb on their own). I have only a little flower for now and not good access to it. What is the smallest batch I can practically make with this method? Usually this is for a cup or more (it will depend on the size of the slow cooker). For a smaller batch of infusion, use the Mason Jar method (which I need to do an article on). Put your cannabis and whatever you are infusing in a small Mason jar. Put a folded kitchen towel in the bottom of a pot of simmering water and put the Mason jar in this. Simmer, replacing water as needed, for about 2 hours. Drain using a small strainer. Also, if you own the Ardent Lift decarboxylator, it is terrific for making small batches of infusions. I show in the video on this page. Tried your coconut cannabis oil recipe in a slow cooker, it looks real good. Going to try making chocolate brownies. You are welcome. Enjoy, Richard! It worked great, now I will try vegetable oil. That’s where I think I will need to use a gravy separator. A gravy separator is handy. But you can also use a large spoon to separate. And of course, adding water is optional, but I personally do when making large infusion batches as it helps flavor and color.